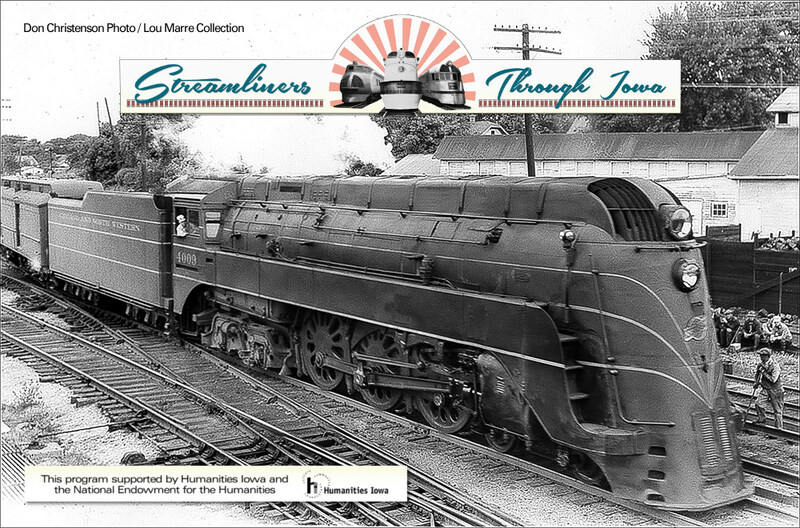 Streamliners Through Iowa is an exhibit at the James H. Andrew Railroad Museum and History Center. This exhibit, partially sponsored by Humanities Iowa and the National Endowment for the Humanities, highlights contributions streamlined trains made to Iowa travel before and following WWII and their important impact on Iowa citizens. The exhibit displays informational banners with topics ranging from streamliner inception, progression, ultimate zenith, and eventual decline of these magnificent machines. Thirteen four-color banners include the following titles: A New Way to Travel, What is Streamlining?, The First Streamliner, Streamliners, Steam vs. Diesel, The Streamliner Experience, Streamliners: Their Economic Impact, Streamliners in Iowa: Post WWII, Decline of the Streamliners, The Chicago and North Western Streamliners, Workers on the Train, and Pullman Porters. In addition to four color banners with rare photography and informational hand outs, the museum will play the DVD American Streamliners in the theater. Also on display will be a combination of artifacts and interactive displays as well as a hi-res informational program highlighting little-known facts about these special streamlined trains and how they affected Iowans. James H. Andrew Railroad Museum entrance fee is $8 adults (12 and over), $3 children (3-11 years old), no charge for toddlers (under age 3) or free with purchase of most excursion train tickets. Boone county residents with a disability who require special assistance and would like to attend this exhibit, please call Boone County Public Transportation at 515-432-5038 between 6:30 am and 5:00 pm Monday-Friday. Rides should be requested at least one day before the date of the trip. This program is supported by Humanities Iowa and the National Endowment for the Humanities.The views and opinions expressed by this program do not necessarily reflect those of Humanities Iowa or the National Endowment for the Humanities. At one time there were more than 1,000 railroad depots in Iowa serving a number of railroads. Our Depots of Iowa exhibit encompasses Iowa railroad depot history beginning with the inception of railroads and their depots in the state, progressing through the golden years, and culminating with the declining years of railroading. Interactive kiosks enable visitors to many Iowa depots. These include depots throughout the state, with a photo and information about each. 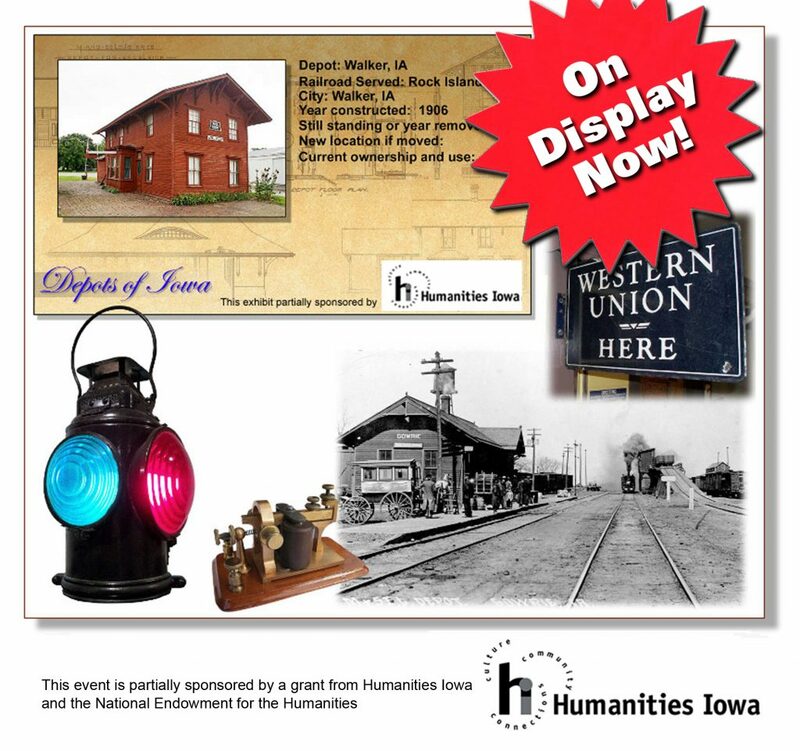 As part of this special exhibit many rare Western Union telegraph instruments used in railroad depots and donated by James H. Andrew of Jefferson, IA are on display. This program was partially sponsored by a grant from Humanities Iowa and the National Endowment for the Humanities. The views and opinions expressed by this program do not necessarily reflect those of Humanities Iowa or the National Endowment for the Humanities. If you have an old depot in your town be sure to let us know about it by e-mailing us and possibly sending a photo. We want to find those hidden depots in Iowa and we need your story!